Droplets are an easy and fast way to batch process images. It is recommended to learn how to use droplets before reading this guide. A droplet can only be created from a batch operation that is already available in the application. A couple of batch operations are installed with the application, other can be downloaded from the batch operation archive and it is also possible to define your own batch operations. %FOLDER%\%NAME%_processed.%EXT% to place the results next to the originals with _processed suffix. For detailed description of what placeholders are available, read the manual for Save Result operation. If enabled, the droplet will automatically open new Explorer window with the default destination folder after processing is done. If enabled, the console with operation results will not automatically close after processing is finished and you may review the results. Some batch operations may require user interaction. If this option is not checked, the user interaction will be skipped and default values will be used. 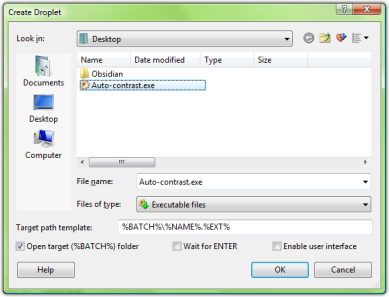 The created droplets are tiny executable files with embedded operation configuration. You can freely copy or move them among computers. You can even delete the batch operation used to create them from the application and they will continue to work as long as RealWorld Photos is installed. If you have used an external plug-in for a droplet and moved the droplet to another computer, the plug-in must be installed on that computer for the droplet to work.